STATESBORO (CelebrityAccess) — All three members of the Atlanta rap group Migos were arrested on Saturday after a concert at Georgia Southern University's Spring Bling was cut short. 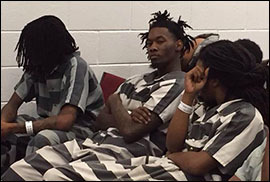 According to the Statesboro Herald, Quavious Marshall, 24, Kirschnick Ball, 20, and Kiari Cephus, 23, all of Lawrenceville, Ga., were all charged with possession of cocaine, Oxycontin and codeine, possession of marijuana (misdemeanor), possession of a firearm in a school safety zone and possession of a firearm during the commission of a crime. Police reportedly smelled a strong odor of marijuana coming from the group's van and investigated the vehicle while the group was performing. Police then ended the concert and arrested all of the members of the group along with a number of unidentified individuals who had been traveling with Migos.